Gridless RM | Rack Mounted Power - Gridless Power Off-grid, clean, rugged solutions for your toughest power problems. Gridless designs solar batteries with the capacity of a generator. 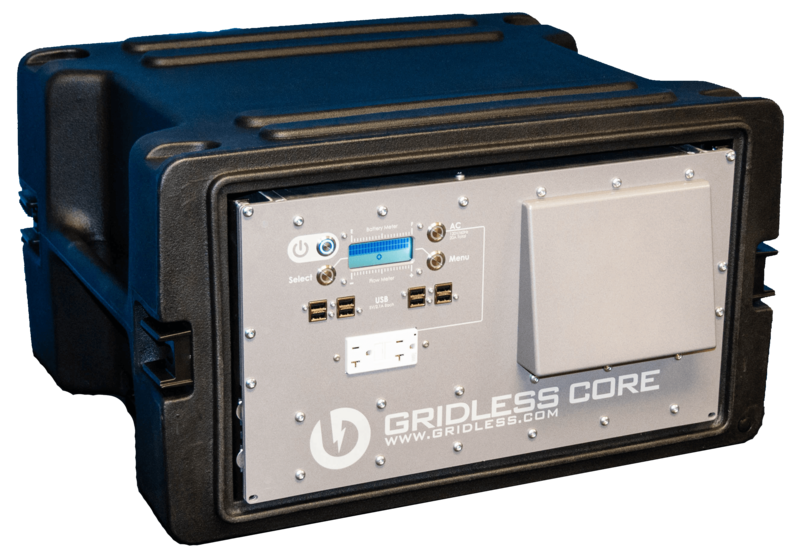 The Gridless RM provides power for any mobile operations team or other rack-mounted application, letting you take serious vehicle-ready power with you anywhere. Gridless products are trusted by federal, regional, and local emergency response teams to deliver critical power. The Gridless RM can power satellite uplinks, remote wifi and 3G hotspots, and more to keep your team connected. Federal emergency response agencies have used the Gridless to expand their vehicle fleet battery runtimes by more than 38x. The Gridless RM can handle daily use for 5-10 years, and there are no battery maintenance requirements or cycle limits.